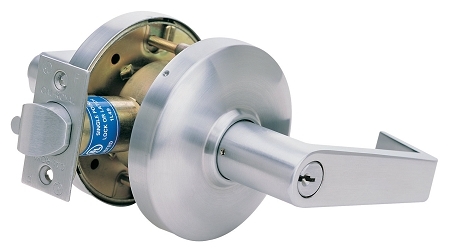 The Genesys CGN01 features Push button locking. Pushing the inside button locks the outside lever. Turning the inside lever or using the key in the outside lever will release the button automatically. Closing the door does not release the button and the latch bolt automatically deadlocks when the door is closed. Other features include panic-proof egress, fixed thru-bolt installation, ADA barrier free compliance, and a clutch mechanism on the exterior lever that will allow the lever to turn freely when locked to prevent breaking the lever.